When you think about Jewish languages, Yiddish comes to mind, and Ladino or Judeo-Spanish comes to mind. 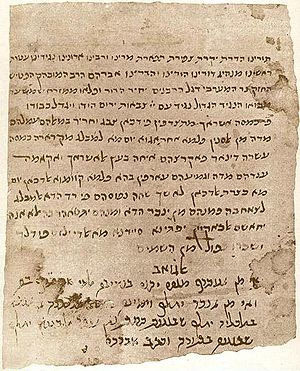 How did Yiddish and Ladino survive in the first place, even when in “exile”? That is when German Jews left Germany for Eastern Europe, they maintained Yiddish as a strong social and cultural marker. When Spanish Jews left for Greece, Turkey, Holland or North Africa, they maintained Ladino as a strong cultural and social marker. First of all back in the days Jews used to live in closed communities which made maintaining the language easier. Yiddish and Ladino were also languages that had a vast literature, especially rabbinic literature, and a way of life so to speak. Jews also believed it would be easier to communicate with other Jewish communities in Eastern Europe by maintaining Yiddish or in the Mediterranean or Holland by maintaining Spanish. But Judeo-Arabic or Judeo-Berber, which are often mentioned in the literature as Jewish languages, were never spoken in exile. Judeo-Arabic often refers to the Arabic spoken by Jews in the Maghreb, that is mainly in Morocco, Algeria, Tunisia, perhaps Libya. Judeo-Berber refers to the Berber languages spoken by Jews, mainly in the Moroccan Rif region, along with the Algerian Chaouia region. Why does the literature mention Judeo-Arabic anyway? Iraqi Arabic spoken by Jews is not considered Judeo-Arabic, nor is the Arabic spoken by Jews in Egypt or Syria referred to as Judeo-Arabic. History and timing is perhaps what makes the difference. Ladino and Yiddish were spoken by communities in exile, that is communities that had long left Germany and Spain but still communicated in Yiddish and Ladino. Yiddish mostly died out with the Shoah, along with Ladino in Greece and Holland. French took over the Ladino community in Morocco and Algeria with the Jules Ferry laws forcing all French citizens to go to public school and study French, while Ladino died out in Turkey with Atatürk's laws forcing mandatory schooling for all Turks in Turkish. Judeo-Arabic was not spoken in communities surrounded by foreign languages, as Yiddish was spoken in Romania, Poland, Russia or Ukraine, or Ladino was spoken in Dutch, Greek or Turkish or Arabic speaking communities. Judeo-Arabic was spoken in communities who spoke Arabic. But Judeo-Arabic is considered by some as a separate language for one main reason: Arabs in the Maghreb tended to be excluded from the Jules Ferry laws mandating mandatory schooling in French territories from 1886 onwards. Jules Ferry laws were accepted by Jews because schooling in French schools was “secular, free, mandatory” while Muslims rejected the secular aspects of the law. So in 1886 when Jews of the Maghreb started attending French schools, but speaking Arabic or Berber at home, they started mixing French with Arabic with a few Hebrew and Spanish words here and there from which a Creole emerged which was not intelligible with Maghrebi Arabic. And that's how Judeo-Arabic or Judeo-Berber emerged as a separate language. The problem for historians is: the language was short lived. By the 1930s Jewish communities of North Africa had started considering speaking Arabic or Judeo Arabic taboo, and encouraged their children to speak exclusively in French. Judeo-Arabic became the language you would speak with your grandparents, before dying out in the 1960s. With the creation of the State of Israel, Moroccan, Algerian and Tunisian Jews who moved to Israel tended to refuse to speak Arabic or French or Judeo-Arabic at home. The North African page had been turned, and North African Jews did not want to look back. Those North African Jews who moved to France also did not want to look back at their North African heritage. While high profile artists like Enrico Macias or high profile historians like Benjamin Stora do publicly speak about their North African heritage, and at length, you can be married to a French North African Jew for 10 years before he mentions that in fact, he does have North African heritage. A final sociological note. In Israel, a North African or Ashkenazi French Jew, who was born and raised in France but moved to Israel, is colloquially called a “Franki”. The term Franki is used for those Jews who were born and raised in France. For those born and raised in Morocco, Algeria or Tunisia, the colloquial term used is “Tzarfokai” which basically means a North African who was raised speaking French. Franki and Tzarfokai cultures are considered very different. Franki culture is considered, pardon the stereotypes, cold and arrogant, while the Tzarfokai culture is considered warm and fun loving.